10. India is known for its breathtaking sights, exotic foods, rich culture and colorful dress. The diversity of the country makes it a journey that can never be done twice the same way. “If you don’t visit India, you’re missing something very interesting and important in life,” said Mr, Dnayaneshwar Mulay, India’s Consul General in New York . 9. India has several hundred languages and a handful of ethnic groups with many sub-ethnic groups that makes it extremely diverse from coast to coast. 8. The colorful dress of the people is just one of the many cultural beauties which include the country’s natural and man-made wonders. “To be exact, [we have] 30 World Heritage UNESCO sites in India. And surprisingly, India is one of those countries that has got man made UNESCO sites, which are not monuments–they are like trains, or man grown forests,” said Vashist. 7. The country has an abundance of natural areas that cannot be accessed by vehicle like thick rain forests, known for their biodiversity of wildlife. All across India, one can see exotic animals like elephants, tigers, lions, and camels. 6. 73 percent of the Himalayas are located in India so travelers can also experience the extremes of mountain climbing and ski where in cold places. 5. In recent years, India also boosted its luxury hospitality industry, providing tourists the option to experience the country like a maharaja (high king). “We have latest products like luxury trains, palace hotels- which are palaces turned into hotels -and these are real palaces, I mean maharajas still live there,” said Meenakshi Vashist, the Assistant Director of the Incredible India New York office. 4. India’s leading luxury train is the Maharajas Express, which only recently opened in 2012 by the Indian government. 3. The train offers elegantly furnished suites with 24-hour service, gourmet meals and complimentary drinks. 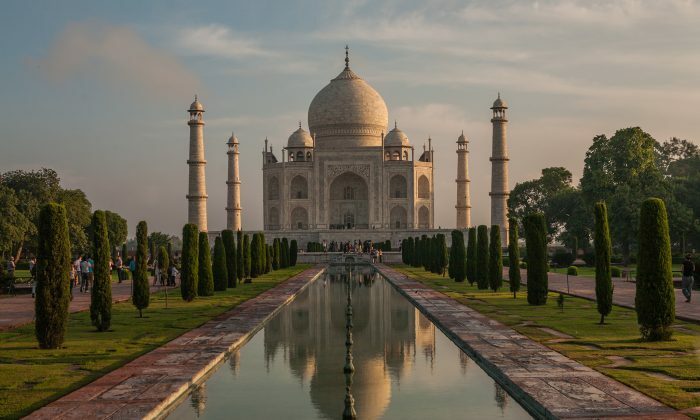 Like a cruise on land, travelers can stop at some of the most iconic sites across India, such as the Taj Mahal and Varanasi, the oldest living city in the world. The whole trip is 8 days and 7 nights, and the price for one adult can range from $6,000 to $23,700. “Everything–boarding, lodging, onboard, off board–everything is included in this. Service is top class. Guests are treated like Maharajas, and there are many outdoor activities which are unthinkable, like elephant polo and cocktails at sand dunes,” said M.P. Mall, the Chairman and Managing Director of the Indian Railway Catering and Tourism Corporation. 2. These luxury trains are great for seeing the famous monuments of India all in one go. 1. Another more in depth way to explore India is by foot. By hopping off trains and cars, travelers can see experience the country in a more intimage way. Festivals such as the Holi festival and the Chariot Festival. Currently, US is India’s number one source of tourism. Over 1 million US travelers visited India in 2013 and tourism is continuing to grow at the rate of 4.3 percent. “India is a place for all reasons and all seasons. It’s a place where you find what you seek. It’s an all 365 days destination,” promises Vashist.